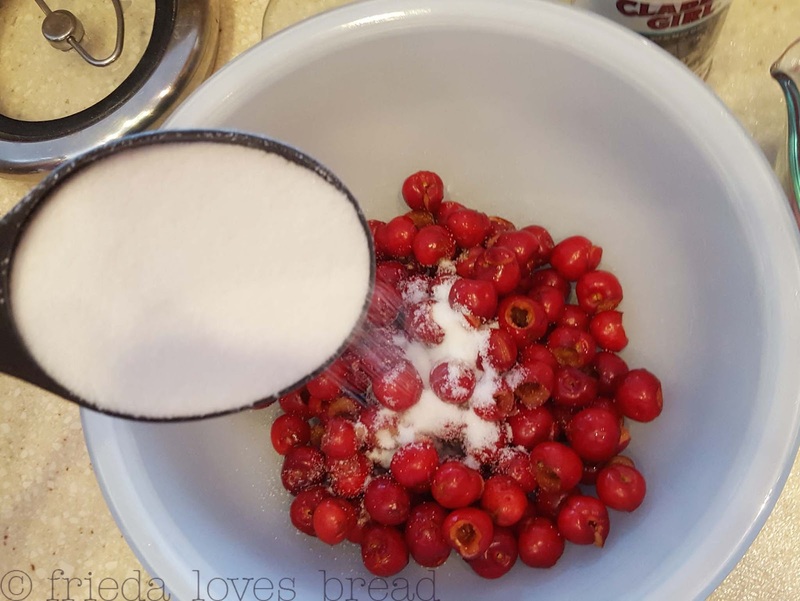 Frieda Loves Bread: EASY Fresh Fruit Cobbler: Cherry! 0 EASY Fresh Fruit Cobbler: Cherry! We purchased a hybrid cherry tree three years ago. It is a single, self pollinating tree, with 3 different types of cherries. The tag had several cherry varieties on it, so we were not sure what the tree would eventually produce. This year, it was loaded with cherries! Two of the cherry varieties were sweet and one of them looked like the Rainier cherry. The third looked like an Early Richmond sour cherry with the many clusters on the branch. 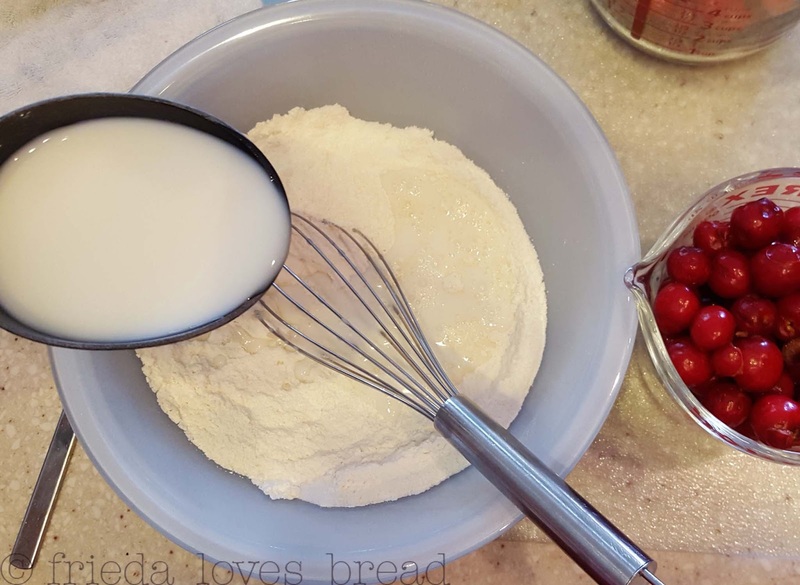 Sour cherries are perfect for baking and great for pollinating a sweet cherry tree. What to do with cherries? Besides eating them fresh, I chose to freeze some and dehydrate the rest. For Father's Day, the gals at our local church wanted to bake pies for the dads to eat after their meetings. 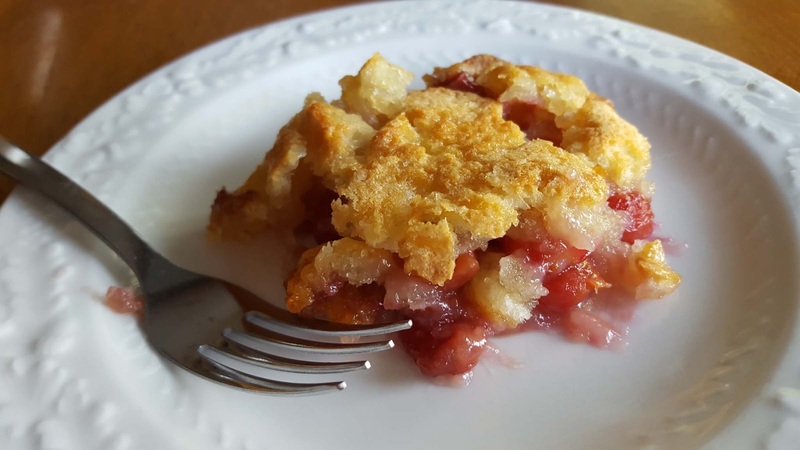 It was Sunday and I didn't want to spend a whole lot of time baking up a pie, so I found a cobbler recipe. My mom would make fruit cobblers on the stove and top them with a sweet Bisquick topping. My hubby would make cobblers in the Dutch oven, using bottled fruit, spices, and a cake mix on top. This recipe is a combo of both ~ a sweet biscuit like topping with a caramelized sugar crunch. And guess what? It is SO easy to make! Save yourself some time and invest in a cherry pitter. I like this one to pit 4 cherries at a time. You will need to check your cherries for pits attached... it happened about 20% of the time. This cherry pitter is around $12 on Amazon. Next, put a stick (1/2 cup) of butter in a 9x13 pan. Stick it in a 350°F oven to melt, about 5 minutes. While the butter is melting, mix up the batter: flour, sugar, baking powder, milk and vanilla. Stir well. Then pour the batter DIRECTLY on top of the melted butter. DO NOT STIR. In your bowl of pitted cherries, add your sugar and flour. Toss to combine. Sprinkle the cherry mixture in a single layer on top of the batter. Any excess sugar stays on top of the batter and creates a sweet, crunchy, caramel-like topping. Bake for 50-60 minutes. Because I used a dark pan and a convection oven, I reduced the temp to 325°F. The cake was done at the 50 minute mark. I couldn't believe how easy this was to make! It took me about 10 min to pit the cherries, but oh, it was SO worth it! Hubby and the kids devoured this up in minutes! Take this cobbler over the top with a scoop of vanilla ice cream. You can use any fresh fruit that you have on hand and even decrease the amount of sugar based on how sweet your fruit is. You can even add extra fruit. Experiment with this recipe and let me know what you think! Fresh cherries are amazing in this oh-so-easy to make cobbler. 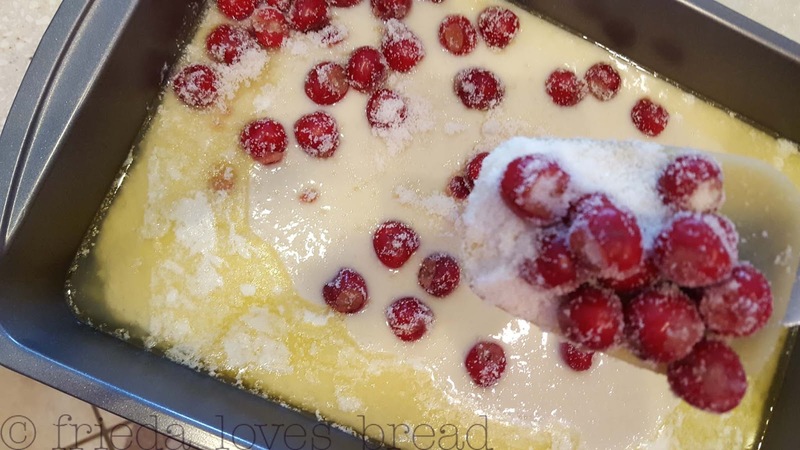 Mix the batter, pour it into a pan, sprinkle the cherries - or any favorite fresh fruit - on top, and bake it in the oven. Batter rises above the fruit to create a biscuit-like topping with a sweet sugar crunch. 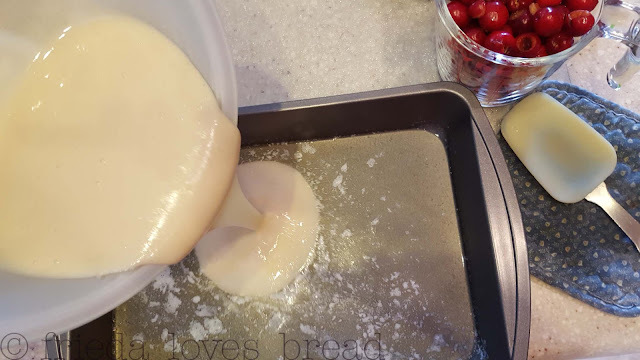 You can even use frozen cherries for this recipe, with no adjustments needed. 2 cups pitted sour cherries - or other fresh fruit of your choice, see note, below. 1. Turn the oven to 350°F.2. Put butter into a 9"x13" baking pan and place it into the oven to melt, about 5 minutes.3. In a medium mixing bowl, combine flour, sugar, and baking powder.4. Add milk and stir well.5. Pour mixture over the melted butter. Do not stir.6. Bake for 50-60 minutes, until the top is golden brown.7. Remove cobbler from the oven and cool. 8. Serve alone or with a generous scoop of vanilla ice cream. *Note: This recipe works great with other fresh fruits. You can reduce the amount of sugar in the recipe depending on the sweetness of the fruit.